During Sony Pictures' CinemaCon presentation in Las Vegas last month, it was revealed that production has finally began on the studio's long-awaited adaptation of Stephen King's The Dark Tower, which is set for release on February 17, 2017. 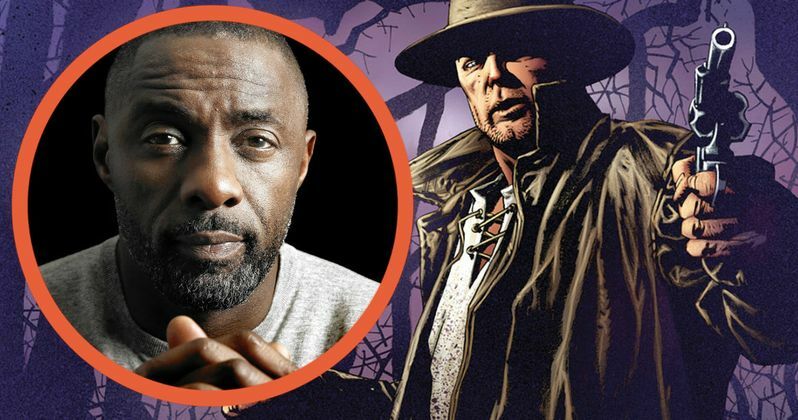 We haven't heard any updates on the project since then, but today we have the first photos from the South Africa set, which offer our first look at Idris Elba in costume as The Gunslinger, Roland Deschain. Unfortunately, we don't get to see any of the actor's co-stars in these photos, but hopefully we'll get to see the rest of the cast in action quite soon. These photos from The Daily Mail show the actor wearing a belt with two holsters on each side, along with numerous rounds of ammo affixed to the belt, as he walks to the set. Another photo shows the actor wearing a trench coat while standing in front of a large green screen, but we don't have any specific details about the scenes that were being shot. It isn't known how long the shoot is expected to last in Cape Town, South Africa, or if the production will shift to other locations as well. The Dark Tower adaptation will bring Stephen King's series of seven novels to life, which follows Roland Deschain, a.k.a. The Gunslinger, who sets off on a journey to find The Dark Tower, rumored to be a portal to other worlds. Roland will be chased by the Man in Black, a.k.a. Walter Padick, described as an "ageless deceiver and sorcerer," who is also trying to find The Dark Tower to rule over all of its kingdoms. Along his journey, Roland will seek help from a junkie named Eddie, an amputee named Susannah and a young boy named Jake, to be part of his team known as a "ka-tet." There has been speculation that The Dark Tower adaptation will actually be based on Stephen King's third novel in the seven-book series, The Waste Lands, where much of The Dark Tower mythology was laid out. The plot follows the ka-tet's efforts to reach out to Jake (Tom Taylor), who is from a different place and time. In the book, that "different place and time" was New York City in 1977, but it may be changed to modern-day. Matthew McConaughey is playing the villainous Man in Black, alongside Abbey Lee as Tirana, Michael Barbieri as Timmy and Katheryn Winnick in an unspecified role. Nikolaj Arcel (A Royal Affair) is directing from a script he is rewriting with Anders Thomas Jensen (Election Night). Akiva Goldsman and Jeff Pinkner worked on the initial draft. Ron Howard, who was initially set to direct when the project was set up at Universal, is producing alongside his Imagine Entertainment partners Brian Grazer and Erica Huggins. MRC is also developing a companion TV series, which will reportedly debut between the movies in this trilogy. While we wait for more details on The Dark Tower movie, take a look at the latest set photos below. "I don't know about Elba in THE DARK TOWER, I'll wait for the mov-"